The EDDY Pump’s open rotor design with high tolerances allow anything that will go into the intake to be passed through the discharge without issues. As you can see in the 4″ EDDY Pump shown above, the tolerance between the rotor and the volute easily allows the passage of a man’s arm , while the tolerance in a centrifugal pump is significantly less. In a 2-inch to 10-inch EDDY Pump the tolerance ranges from 1-9 inches. This translates to a significant amount of solids and debris that passes through without clogging the pump. Simulation video of the EDDY Pump compared to a centrifugal pump. The EDDY Pump shows its superior ability for high viscous pumping, high corrosive pumping, high specific gravity pumping, and high solids pumping, while being a low maintenance pump that is also a non-clogging pump. High Viscosity Red Mud Moved Like Water! Amazing video demonstrates the EDDY Pump effect in action. The EDDY Pump rotor acts as a mixer on thixotropic materials and provides a shear thinning effect. The EDDY Pump’s ability to pump concentrated solids is perfect for moving viscous materials with less than 5% free liquid; an impossible task for centrifugal pumps. The EDDY Pump is excellent at moving heavy materials through long pipelines. The EDDY Pump creates a turbulent flow that helps keep the heavy materials in suspension and moving down the pipeline. 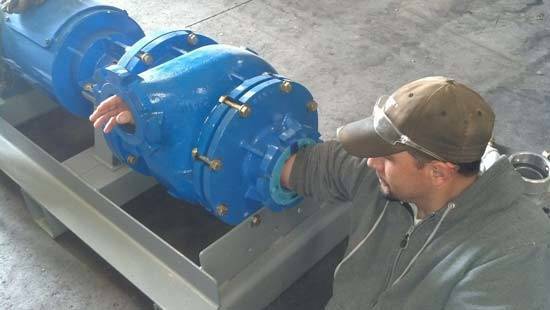 The EDDY Pump design and superior performance allows for a significantly decreased Ownership Cost over centrifugal and PD Pumps. Please see link below to see a the Total Life Cycle and Ownership Cost Study conducted by one of the largest US Navy Ship Building Companies in the World, showing that 25 EDDY Pumps would save the US Military over $17,000,000 over 4 years in operation. Up to 300% higher than a similar sized centrifugal pump in pumping non-organic material. Less fluid required to pump a given amount of material. Up to 80% solids by volume in-situ. EDDY Pump does not require critical tolerances between the rotor and the volute, making the EDDY Pump the perfect solution for abrasive and corrosive applications that often cause significant issues for other pumps. The EDDY Pump will outperform any pump in moving the most abrasive fluids with minimal wear and no maintenance. These include lime slurries, borax, drilling muds, and ash. Pump less water, more solids and you have huge cost savings. To move the same amount of material the EDDY Pump will be smaller in size, lighter in weight, use less power and cost less than conventional equipment. Further, there is no critical setup, eliminating the expense of balancing and alignment that other pumps incur. The EDDY Pump can be customized to a specific flow rate and Head requirement for an application simply by changing the rotor size. Each pump model has multiple rotor options available. This allows for the most efficient combination of pump and motor size for the job. Rapid Prototyping and Research Done In-House. EDDY Pump has dedicated engineers for pump modeling and analysis. We can go from concept to modeling and then pump out a 3D printed test unit in 48 hours. Heavy investments have been made in hardware and software to assist the research team. Our comprehensive knowledge of fluid dynamics as it relates to pumps combined with our experience in structural engineering allows us to provide completely optimized pumps and dredging equipment with adjoining pipelines and hoses. Our research and development utilizes computational fluid dynamics (CFD) software to accurately calculate flow uniformity across the system. At EDDY Pump, we are constantly striving to improve and innovate new technologies to incorporate into our pump and dredging equipment.